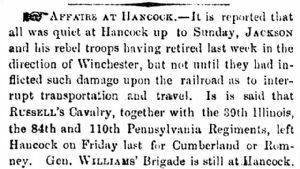 It is reported that all was quiet at Hancock up to Sunday, JACKSON and his rebel troops having retired last week in the direction of Winchester, but not until they had indicted such damage upon the railroad as to interrupt transportation and travel. It is said that Russell’s Cavalry, together with the 39th Illinois, the 84th and 110th Pennsylvania Regiments, left Hancock on Friday last for Cumberland or Romney. Gen. WILLIAMS’ Brigade is still at Hancock.